The Charlie Knight Store building, shown to the left, sat roughly where the Orlando Post Office is now located. 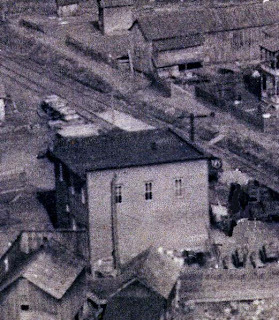 The store faced the B & O Railroad tracks which were where the (poorly named) Cemetery Road is located today. The store, in continual operation from about 1890 until the late 1940s, had many owners in the early years but Charlie was the longest and last proprietor. For that reason, and because of Charlie himself, the establishment will be remembered as "Charlie Knight's Store." The history of the Charley Knight Store must begin with Ann Skinner1, daughter of Alexander and Phebe (Conrad) Skinner, who sold the 4800 square foot parcel of land to Henderson D. Mitchell in 1891. Mitchell erected a two story building on this lot and operated a general store. Mitchell had living quarters on the second floor. Unfortunately, Mitchell ran into financial difficulties and the store property was sold under foreclosure by the Baltimore Building and Loan Association in 1898 to Peter F. Kennedy and his wife Mary Jeanette Kennedy. The Kennedys were operating the store at the time the Coal and Coke Railroad built its Charleston line through Orlando. The photo above was taken when the Kennedys owned the store2. During the Kennedy period, Sylvester D. Oldaker worked as a clerk in the store, and in 1907 Kennedy decided he wanted to try his hand out west and moved to Colorado. Kennedy sold the store to his clerk, who incorporated the enterprise as the Oldaker Mercantile Company. The Oldaker Mercantile Company under S. D. Oldaker operated this store until 1913 when he also got the itch to go west to California . That same year Oldaker sold a one-fourth undivided interest in the store to Gidion Draper Skinner and a three-fourths undivided interest to R. E. Heizer of Charleston, who promptly sold his interest to George F. and Edna Bennett. Sylvester Oldaker removed his family from Orlando and the fifty six steps it took to climb to his house on the hill3 and went to Los Angeles. Oldaker didn’t stay long in California and was back in Orlando by 1915 when he went into competition with his former store by opening a store in the Frank Blake building on Clover Fork Road. In 1916 George F. Bennett and his wife Edna sold their three-fourths undivided interest in the store to Edna M. Foster and Daisy S. Woodell. Foster and Woodell then sold another one-fourth undivided interest in the store to Gidion Skinner. At this point, Skinner owned a one-half interest and Foster and Woodell owned the other one-half in the store property. In 1917 Woodell sold all of her remaining interest to Edna Foster. In 1921, Edna Foster decided she had had enough of the store business and she sold her in interest in the store to Charley Knight and W. Bates. Thus began the era of the Charley Knight Store. Gidion D. Skinner’s interest in the store property was foreclosed upon in 1935 and was sold to Charley Knight for $340. Alva J. Barnett and Joseph Emery Riffle cosigned the note for Charley to finance the purchase of the G. D. Skinner interest. Earlier in 1933, Charley had bought out the interest of his partner, W. Bates. Charley Knight operated the Charley Knight Store exclusively from 1935 until 1954 when he sold the store building to Wilbur Dexter Brown who had shortly before bought the Bill Conrad Store. Thus came to an end the oldest operated store in the history of Orlando. The building was dismantled in the mid 1950s. 2. 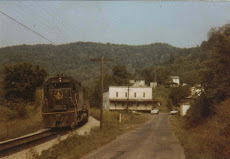 Notice the railroad ballast on the Coal and Coke line is fresh and clean. Obviously in the days of steam locomotives the photo must have been taken soon after the line was completed. My guess is 1905 for the date of the photo. -David Parmer. 3. Edward L. Oldaker lamented the 56 steps it took to climb to the Oldaker house on the hill in his book The Oldacre/Oldaker Story see page 335.